Chamartín Train Station, Madrid's Second Railway Station. Chamartín Train Station, or Estación de Tren de Chamartín, is an important railway station in Madrid. It is located in the north of the city about six kilometres from Barajas-Madrid International Airport. 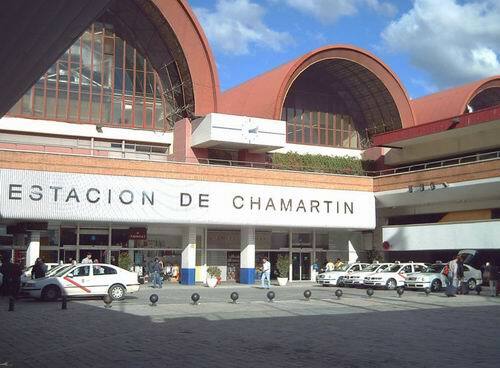 Chamartín train station is mainly served by trains from the north and the east of Spain, as well as from France. Chamartín train station is to some extent overshadowed by its bigger brother, Atocha station. However, like its bigger brother, Chamartín is modern, light and airy. It has a feeling of spaciousness and actually resembles an airport much more than the old traditional view of a place where trains come and go. The station is very large and even includes a hotel, the Hotel Husa Chamartín. Below it down some stairs you will find the Chamartín Metro Station, and it should come as no surprise to learn that they are all contained in a district of Madrid known as Chamartín. Close by are the neighbourhoods of Ciudad Jardín, El Viso, Nueva España, Prosperidad, Pza. Castilla, and Hispanoamérica. Though the station is not quite as grand as the bigger Atocha train station, it does have many facilities that traditional train station don't commonly have. The huge hall has more than just ticket sales. There are bars and restaurants, shops selling books or newspapers, sweets or light packaged snacks. There is bowling available, a left luggage service and car parking. You can hire a car, take a taxi, or get all the tourist or hotel information you could ever want. Chamartín train station is close to the Estadio del Bernabeu where Real Madrid, Spain's famous football team, regularly play. It is located just across the road from the Cuatro Torres Business Area, and is also close to the AZCA commercial district with the emblematic Torre Picasso, the IFEMA Trade Fair Park, and the Palacio de Congresos.